$0.99 (1 bid) Set of 6 Wallace Grande Baroque Sterling Silver Dinner Knives Knife 9 "
$29.0 Towle Candlelight sterling silver four pieces. $150.0 Antique Gorham Reticulate Sterling Silver Spoon Pattern No 586 No Mono Stunning! $39.99 REED & BARTON CLASSIC ROSE STERLING SILVER SPOON ! NO MONOGRAM ! BEAUTIFUL ! 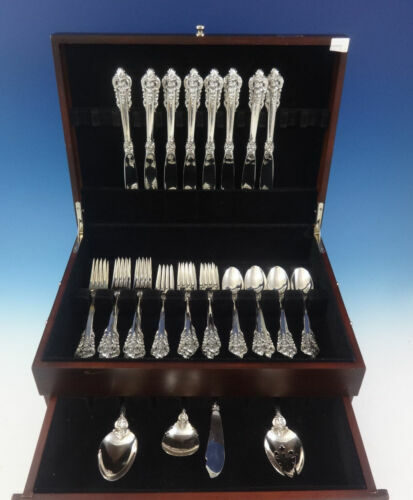 $99.0 Blithe Spirit GORHAM Sterling Flatware Set of 4 Spoons 6 7/8"
$45.0 REED & BARTON CLASSIC ROSE STERLING SILVER (SALAD OR DINNER) FORK ! NO MONOGRAM! $29.99 HaZorfim Sterling Silver carving knife brand new..